Ready to have a go at making a beautiful piece of pottery and have great fun in the process? Adult tuition run throughout the year — available at Pottery Courses link or please contact me at chris@chrisgreeningpottery.co.uk or on 07450008183 to discuss a date. The lessons are for up to 3 people and last for 1hr 30 mins. One off “taster” lessons, as well as multiple sessions working on a range of projects can be catered for. "Chris was a very knowledgeable, patient and encouraging teacher and it was great to have some one to one tuition." "I went with my mother in law as a joint Christmas present from my sister in law and we had a fabulous time! We've both done a bit before and Chris was very adaptable, gauged our abilities very quickly and supported us as and when needed. We both felt much more confident as a result! He offered lots of tips and suggested various methods that helped me find my feet again on a wheel. He taught me alternative methods for handles and glazing that were interesting and much easier than I had learnt previously! The morning flew by and we had a wonderful time! Totally recommended and hope to go again soon!" "I booked 6 lessons with Chris and enjoyed every minute. Chris is a skilled teacher, very encouraging, explains everything really clearly and helps you produce beautiful pieces of pottery. I came away with an assortment of mugs, bowls and little vases, a full set of clay stamps (which were fun designing!) and a knowledge of how to throw, slip and decorate my creations." You can see more reviews on my Craft Courses webpage as well as on my Facebook page. £45 for 1-1 sessions. Discounts are available for multiple 1-1 sessions (£40 per lesson for set of 2-6 lessons, £35 per lesson for 7 or more lessons) booked at the same time. £80 for 2 people booking together. Discounts are available for multiple (2 person) sessions (£70 per lesson for set of 2-6 lessons, £60 per lesson for 7 or more lessons) booked at the same time. £120 for 3 people booking together. Discounts are available for multiple (3 person) sessions (£105 per lesson for set of 2-6 lessons, £90 per lesson for 7 or more lessons) booked at the same time. transferring money via paypal to sales@chrisgreeningpottery.co.uk I then will confirm by email and provide further details about the course and give you an opportunity to provide some preferred dates and what you are looking to achieve. transferring money via BACS payments; details available on request. you can join in on 1 of our set dates for these combined classes (max. 6 people, 3 in each class). Dates will be confirmed in early 2019 but please do enquire if you have a date in mind which we will then add to our options list. The day will include a pottery class of 2.5 hours and a glass class of 2.5 hours with a ploughman’s type lunch and breaks for tea/coffee in between. Timing will be approximately 10am - 4pm including breaks but timings of the bespoke days can be tweaked to suit. NB Each day will need a minimum of 3 people in order to run. £130 per person for an individual booking. £240 for 2 people when booked together. £330 for 3 people when booked together. £100 per person when 4-6 people book together. The above includes the firing of a selection of your pieces (for collection in approximately 2-3 weeks). Please make an enquiry if you are interested in knowing more. You can see more about Sarah’s fused glass taster classes on his website: www.sarahgreeningglass.co.uk. Feel free to contact either of us to discuss a tailor made session. Here you can see us outside our workshops on a bright, but chilly February afternoon - aiming to get back into the warmth of our own studios asap! The one-off lesson is suitable for absolute beginners as well as those revisiting skills that may have got rusty. If you have a particular project you want to try out (e.g. flower pot, mug, jug, tile, plate, hanging decoration) then we will discuss how you can achieve that in the time available. Pottery is a very broad subject and it can sometimes be difficult to know where to start, but if you just want to “have a go at pottery” then we can generally fit in a go at throwing a pot (or two) as well as trying some hand building techniques, such as a tile or plate. The aim will be to have made something you can either take home (in raw clay state) at the end of the lesson or wait for it to be fired. The workshop is equipped with three potter’s wheels, slab roller (good for making tiles and platters), extruder (for squeezing clay shapes), kiln and a range of tools which will be available for you to try out. All you have to bring is an idea of what you might like to have a go at making, as well as old clothes—you will get covered in clay! Aprons and towels are available. We will use earthenware (the clay used in garden pots) clay which gives a wide range of decorative options. If you book multiple sessions then we will discuss what you want to achieve over the number of lessons booked. If you are new to clay or are a bit rusty we can get you back up to speed on the basic skills of throwing (particularly centering) and hand building. We can investigate how texture and colour, via slips (coloured liquid clay), can add a variety of finishes to the pots you make. 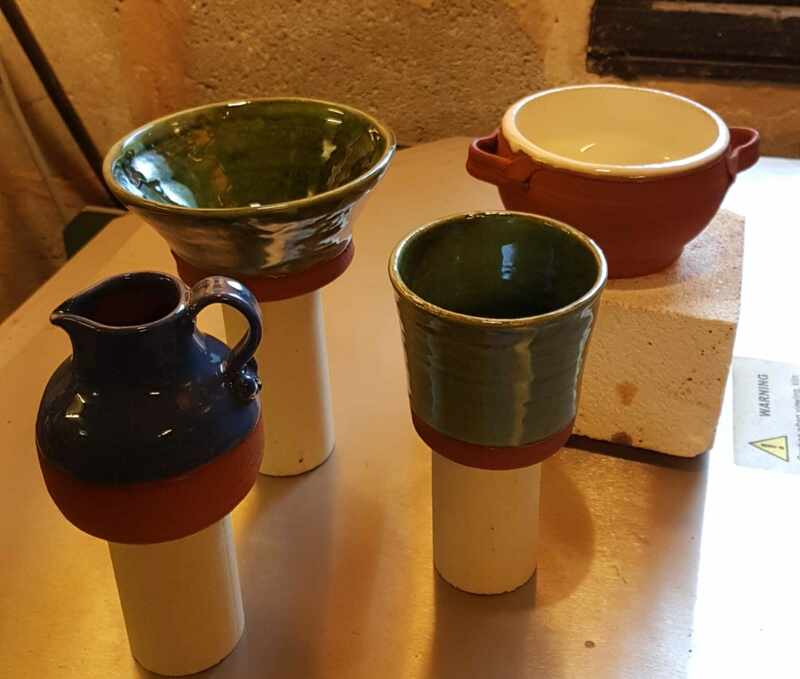 Developing throwing skills from cylinders into mugs, jugs and vases as well as bowl forms (shallow to deep). Considering the use of slabs of clay to make single (e.g. tiles and platters) and composite forms (e.g. boxes) and how those can be developed into a range of altered shapes. Lessons include approximately 5lb of clay and the firing of two of your pieces per session, which will be ready approximately 3 weeks after the session. Please note - if you cancel your booking within one month of the course date, I reserve the right to charge for the course unless a replacement person can be found for the course.